Cochin, the commercial capital of Kerala, served by an international airport, fine communication facilities, excellent accommodation, modern amenities and a lot of attractive tourist places, gives a breathtaking experience for its visitors and settlers. The district called Ernakulam where Cochin is located took its form on 1st April 1958, by carving out the areas of erstwhile Travancore, Kochi & Malabar kingdoms. The word Ernakulam was derived from a Tamil word ‘Erayanarkulam’ which means ‘Lord Shiva’s abode’. Cochin with its rich history, cultural heritage and archaeological wealth was the cradle of art and culture in Kerala.It has a large number of historical monuments to show case before its visitors. The European influence is clearly visible in the large number of ancient buildings that are a legacy of a bygone era. Cochin also has a large number of institutions that present a peep in to the ancient art forms by way of murals and paintings in the walls of temples and buildings.The contributions made by highly gifted men enriched its image all the more. Cochin, the Queen of Arabian Sea offers the guests a plethora of charming visuals manifested in the ancient Chinese fishing nets, monuments, synagogue, etc…..
Cochin is well connected by air, rail, road and waterways to all major cities within and outside Kerala. 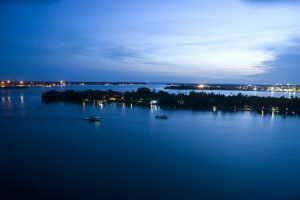 So, welcome -Visit, explore and have a great enjoyable experience of the scenic Cochin and also its commercial beauty….